One of a set of six with XF4, XF5, XF6, XF141 and XF142. Four of the chairs with pink and cream striped damask drop-in cushions (modern). The top rail composed of four narrow rails with rounded front edges and central strut; the cross rail composed of three similar rails; paterae on top of the side supports; arms with turned moulded balusters; caned seats; turned front legs and sabre back legs. 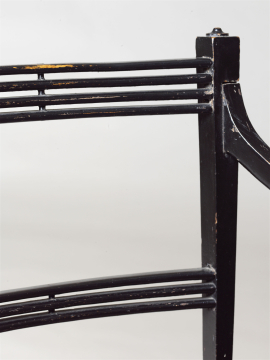 These six chairs are all that remain of the set of ‘8 wood, painted Elbow Chairs with cane bottoms, cushions covered with striped cotton cases’ listed as in this front Attic in the Furniture and Fittings inventory. The original cushions do not survive but it seems likely that the relatively modern striped cushions present today either replaced them and attempted to replicate them or were intended to be similar to what was described. 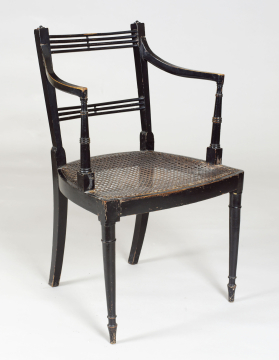 These are neat Regency bedroom chairs, in character not unlike the pair of chairs originally in the Study (XF147 and XF148).